LONDON, ENGLAND, November 2, 2016 (CNA/EWTN News) -- In the 14th century, approximately one third of the population of Europe - or anywhere from 75 million to 200 million people - was wiped out due to what became known as the Black Death. Characterized by and named for the black, bulbous sores that oozed pus and blood, the affliction typically killed its victims within two to seven days. The Black Death, also known as the Black Plague, understandably shook the faith of the people of Europe at the time. It was shortly after its reign of terror that an anonymous Dominican friar wrote “Ars moriendi”, or “The Art of Dying,” a six-chapter work explaining the Church’s perspective on a good death. It included catechesis on why death was not to be feared, how the soul could prepare itself for death, and proper prayers to for the individual and loved ones to say at the time of death. A shorter version translated the book into 11 woodcuts illustrating the work. 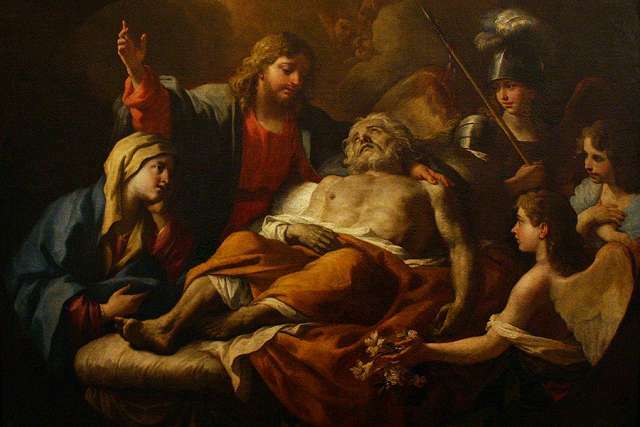 Now, more than 600 years later, “The Art of Dying” got a facelift, thanks to the Catholic Church in England and Wales. The teachings have been translated onto the website, The Art of Dying Well, complete with animations, video interviews with experts and priests, and explanations of various aspects of preparing well for death as a Catholic. The new resource was debuted today, a day before All Souls’ feast day, where the Church remembers and prays for the dead. “Most people have an instinctive fear of death, but many also have a conviction that something lies beyond, that death does not have the last word,” the website explains. The Art of Dying website is split into five categories - What is dying well?, Talking about death, Facing death personally, Losing a loved one, and Caring for the dying. It also explains the various means of spiritual support available through the Church for a dying person, including the Anointing of the Sick, and final reception of the sacraments of confession and communion. It also addresses the big questions people often have at the end of their lives the meaning of life, suffering, and the goodness of God. “Sometimes people wonder, when confronted by tragedy or suffering, why God lets it happen. When we are tempted to echo those words, we need to remember that God is now and forever at the heart of any human suffering,” Fr. Peter Harries, the Catholic chaplain at University College London Hospital, told The Art of Dying. But The Art of Dying is not just for Catholics, the creators of the website explain in their ‘About’ section. “There is a shared interest in discussing how we can make death more peaceful and meaningful. It is likely that you will share the Church’s concern that sometimes, particularly in hospital, dying patients are subjected to unnecessary medical interventions that prolong suffering,” they said. In an age where physician-assisted suicide and euthanasia, both of which the Catholic Church strongly opposes, have become increasingly popular, the updated Art of Dying could serve as a valuable resource for Catholics and people everywhere who are looking for answers to their questions about how to die a good death. “After centuries of ministering to the dying, the Catholic Church has a fund of experience to share in what was traditionally called the art of dying well,” the website explains.